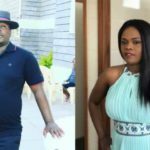 Controversial Pastor Kanyari has come out to prove he’s not a deadbeat dad and a stingy man as his ex-wife Betty Bayo once claimed in an interview with radio Jambo’s Massawe. “We are neither enemies nor friends, but we coordinate where it is possible. He is a stingy man who only provides little for his children, Bayo said in the interview. Spends a lot In an interview with Mpasho, Kanyari said that he sure takes care of his kids and make sure they live well and attend good schools. The pastor said that he does most of the heavy lifting while Bayo mainly provides food. “I take care of my children and pay. She only provides for food which we also help each other sometimes. It costs me sh450,000 every term because they are in one of the best schools,” He said. The post Pastor Kanyari on being called deadbeat dad: I pay Ksh 450K every month and my kids are in one of the bests schools appeared first on Ghafla! Kenya.